There's a good chance your computers, streaming media players and other Wi-Fi gadgets are running more slowly than they could be. While Wi-Fi does offer wireless convenience, it's not the fastest way to connect. The farther your computer is away from your router, or the more walls or floors lie between you and your router, the worse your connection is likely to be. And the worse your connection is, the slower it is. When you've just gotten home after a long day at work and just want to stream the latest episode of NCIS, stuttering video is a real frustration. You may be tempted to call your internet provider to upgrade your service, but that may or not help the issue. Your router could be the problem instead. While it's easy to plug in a router in and proceed to forget about it, the tech that powers home networks gets faster every year — so if you haven't upgraded lately, your connection quality may be suffering. Enter this year's latest router: the Whole Home Wi-Fi system from TP-Link. The heart of this system is the Deco M5 router, which uses Wi-Fi mesh technology to whisk speedy connections throughout your home. Use a single Deco, which covers about 1,500 square feet, or get a trio of Decos to cover 2,400 to 4,500 square feet or more. A single Deco works a lot like an ordinary router, but with multiples, you set up a Deco in each area of your home. The Deco walks you through where to put each unit and what kind of network protocol to use. 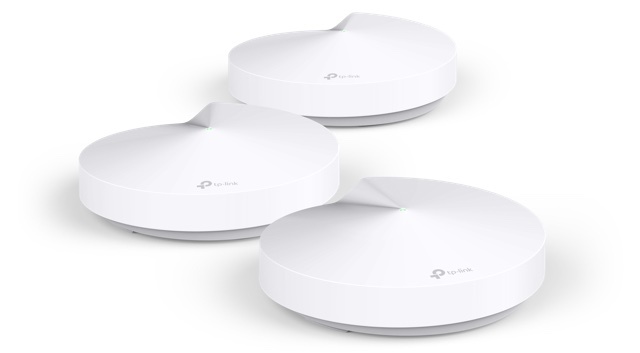 A trio of Decos can work together to provide a strong Wi-Fi signal throughout the whole house. It's a bit like using Wi-Fi range extenders but without the hassle of setting them up and connecting to them individually. While the improved Wi-Fi coverage of the Deco M5 is great, a wireless connection is still slower than a wired connection, which is a big problem when you want to stream 4K video. If you need a speedy connection, you need a wired connection. You could always plug your computer directly into your existing router with an Ethernet cable, but the average home doesn't have that kind of wiring. That makes Ethernet expensive or inconvenient. You'll need to hire a contractor to run wiring or learn to cope with cables running all over your home. The Deco M5 Plus with Powerline lets you avoid both the slowdowns of Wi-Fi and the hassle of running cables. Instead, it uses your home's existing electrical wiring to transmit data. Doing anything to your home's electrical wiring may make you nervous (or make you think you need to shell out cash for an electrician), but Powerline does all the work for you. If you can plug in a power cable, you can set up a Powerline connection. Just plug in a Powerline adapter to a power outlet near your router, then plug in a second adapter near the device you want to connect. Plug each device into the adapter, and you're connected. It's as simple as that. The TP-Link Deco M5 Plus with Powerline gives you the best of both worlds: reliable Wi-Fi coverage throughout the house using mesh technology, plus speedy Powerline wired connections where you need something faster. The Deco M5 will be available this spring. TP-Link also offers a whole suite of lighting and home control products that start at just $19.99. Find out more in the video below.